There've been a few threads floating around about Jailhouse Blues, and as I've just finished making my own for one of my keyboards (typing on it now), I realized it'd be good to have a central thread for the discussion of this modification. To start off, "Jailhouse" Blues are modified MX Blues, with filler material inserted between the white and blue parts of of the stem to prevent movement of the two pieces with respect to each other. It also results in reduced travel distance as well as the actuation point moved closer to the top. Leslieann: http://geekhack.org/index.php?topic=38091.0 - christened these switches "Jailhouse" due to the wire "shackles"
If I have missed anyone else who've made JB keyboards, please forgive me. Let me know, and I'll add proper links / credit! There are various ways of making Jailhouse Blues, as can be seen from the Credit threads. These include wrapping crafts wire, wrapping solder wire, using small strips of plastic cut from a credit card, glue (poor success rate in terms of consistency), and skinny silicone o-rings--the latter are what I realized I could use, after some mixed success with cutting tiny zip ties. All of these methods result in slightly different feel. Because in most cases, inserting extra "stuff" between the blue and white parts of the stem reduces the available room for the spring to move around, the spring is naturally compressed even in its relaxed state. Its effective stiffness is increased. Using stock 60g springs results in much stiffer switches. As a compromise, Leslieann recommends cutting the springs a bit to reduce stiffness and bring back the lightness of regular Blues. Another alternative is to use lighter springs (I chose 45g Korean springs for my project). Individual experiences and discussion to follow below. Initially I really liked Khaangaaroo's QFR with Jailhouse Blues, though the stock springs in it were a bit too stiff for my liking, so I started thinking and planning a conversion of my Filco with Blues into Jailhouse Blues. I liked the idea of using plastic but was afraid of imprecision when cutting bits of old credit cards. I thought of using very skinny zip ties. Only issue is that it's apparently impossible to find zip ties narrow and thin enough to fit properly without modification. I then ordered the smallest possible zip ties from mouser.com and planned to cut them to be even narrower. When they arrived and I tried them, cutting turned into a very imprecise job as well, as the resulting width varied enough to produce noticeable differences from switch to switch. I was almost ready to get some wire when my eyes went to a couple of bags of IMSTO's silicone o-rings laying around without use (the fat ones and the very thin ones), and I thought I'd give the skinny o-rings a try. It turned out that they were a really great fit! I used the tiniest screwdriver to help the o-rings along in between the white and blue parts of the stem and snipped off the remnants. Also I used tweezers (very useful for this tedious operation) and tiny manicure scissors. Every 3rd stem used the remnants of two o-rings used from the previous two stems. 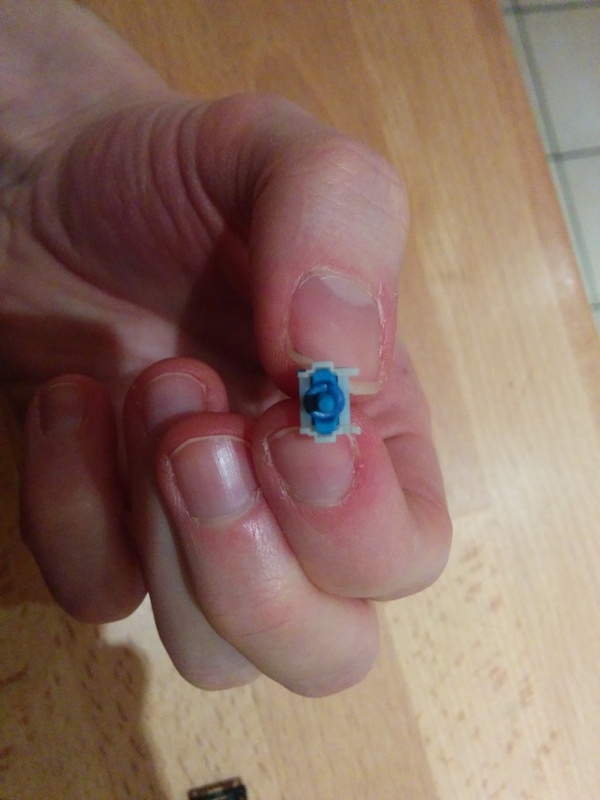 If I tightened the o-ring to go exactly around the central stem, some movement of the white part with respect to the blue became possible, and the characteristic click of MX Blues remained, while the travel distance was still somewhat reduced. 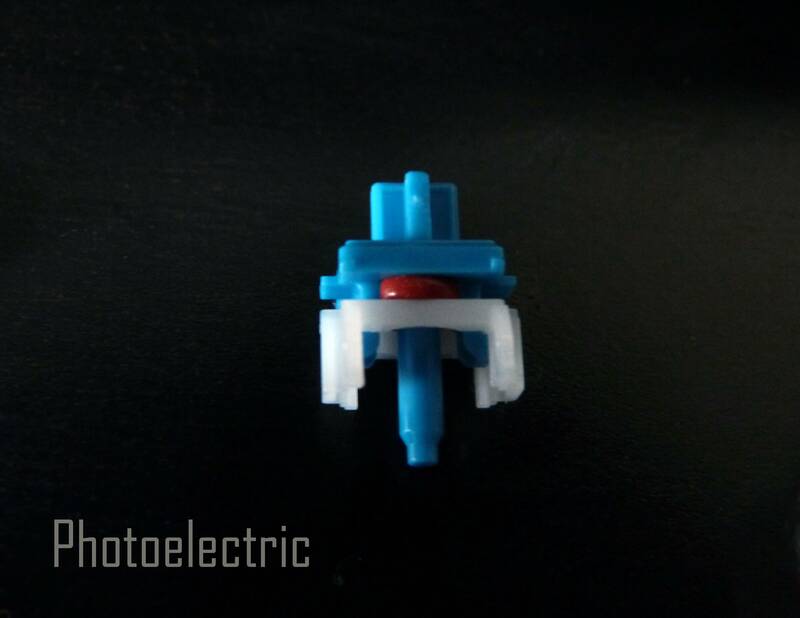 If I kept more of the o-ring between the white and the blue parts, such that it would stick out on both sides and prevent their movement almost completely, I would get mostly the Jailhouse Blues Khaangaaroo achieved with plastic strips: no click and short travel distance. 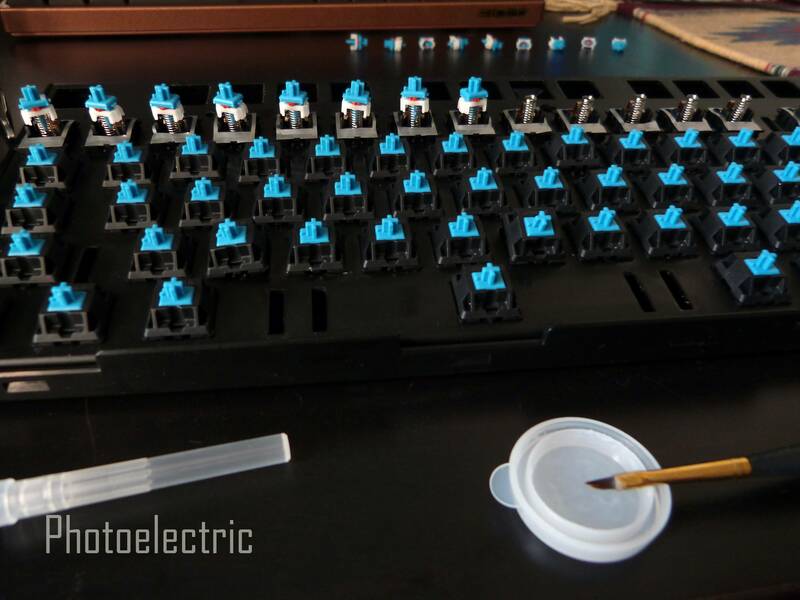 An additional benefit of using silicone o-rings is that the switches are now extra dampened. The keyboard is ridiculously quiet for Cherry MX. Bottoming out is very quiet even without putting any o-rings under keycaps. Using 45g springs, the resulting feel is somewhat like ergo-Clears with a faster bump close to the top and short travel distance. It's very soft too. I very much like the end result. I did spend a fair amount of time making sure the o-ring did not stick out beyond the boundaries of the stem (only a tiny bit is allowed, as more will make it rub against the housing and will make the switch sluggish). Great job sir. This is probably the most tedious mod. More time consuming per switch than lubing. That looks like a pretty modded up Filco. Custom controller, plate, jailhouse blues, and lubing. Thank you, it was fun, but definitely ridiculously tedious. Your universal plate is super nice! There's also a painted blue-green metallic cover for that case, but I'm waiting until tomorrow to do photos in bright daylight. That and some keycaps... using remaining Ducky Shine caps right now as they are all I have that's unused. That is the thread where I got the idea from, and predates all of the rest. While it's not quite what Jailhouse Blues became (he was after a "ghetto browns"), Lanx should probably be credited with realizing that you could alter blues to perform how you want. I don't think Lanx ever even got it fully working, or if he even realized what he had done, but he set the stage. At least for me. By the way, at what point is a Filco no longer a Filco? Like Photoelectric, mine has almost nothing left original, in fact, all I have left that remains from the actual original keyboard is the main PCB, the stabilizers, and 4inches of internal cable. I can give a list of the mods, but it's extensive to say the least. The only new things in mine are the plate, the o-rings in the Blues, case paint, and the controller. But the controller is probably only temporary. Will update the OP with the links--thank you! Definitely an interesting take on it Photoelectric. Your's is actually the first one I actually really want to try. And Leslieann, way to be awesome and give credit to an earlier mind. Yours is the first one to really gain traction, but it's nice to see you willing to give credit to where you got your inspiration from. I call it a failed attempt because i started in the right direction and even made 60 of them, but i learned that there is such a thing as messing this mod up. i spent a good whole night with this mod and i am still convinced that you can do this mod with the material i used. Big mistake was that i didn't test each one until i put them all together and each one of them felt differently there was no consistency. Some of the switches felt as described by others here, but some felt like i was crunching something. I learned later it was how i stuck the wire through only one part of the slider as pictured http://www.flickr.com/photos/panicfx/8590931515/ this led to the springs hitting the slider at an angle which is why i got a crunchy feeling. i was that stupid not to think of that.
. This was also my first time taking apart switches (and lubing) and i broke some of the switches by damaging the leaf inside so that also happened and i learned another lesson there. Good thing was after this incident i never messed up the 2 keyboards i did lubed reds with or the ergo white mod i did or the 45g blues. For those interested in the o-ring mod, i may have some progress. I saw that you can get them in different diameters if you get them from an hardware/plumbing/o-ring source (as opposed to a keyboard accessory source). The keycap ones are about 5/16 OD (outer diameter), and I found some for 7/32 OD and 11/64 OD. I bought some of both (6 bucks for a hundred) to try this mod with. 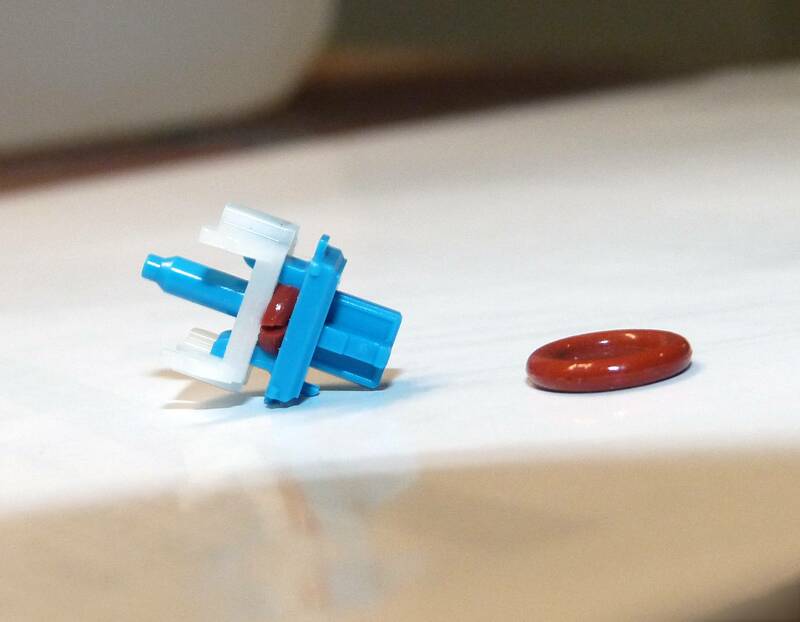 I was hopeful that the 7/32 was going to be the magic perfect fit, because if you measure the width of the little blue and white pieces they are almost exactly 7/32. But, the problem is the o-ring doesn't fit in there without squishing it so if you put the whole thing in there it still sticks out the sides. But I found that if you cut between 1/3 and 1/4 of the ring out and then just shove it in from the bottom, it fits well and is pretty quick. I only did about 3 of them so far but my results were similar to yours, Photoelectric. Ridiculously quiet, and with a soft squishy landing. I like it! Hope I end up liking it with the whole board done. The 11/64 OD o-rings don't get here til next week, but I think they are gonna work even a little better since you won't have to cut as much out of it to fit it in there. forgot to mention: I nominate "nuthouse blues" as the moniker for the o-ring version, because the soft padded landing + jailhouse evokes the image of a padded room, at least for me. so how do they feel? are the o-rings sitting so snug that the slider isn't moving anymore or are they thick enoguh so there is no room to move? they feel wonderful, to me. they feel like a short, tactile throw with a soft squishy bottom impact. 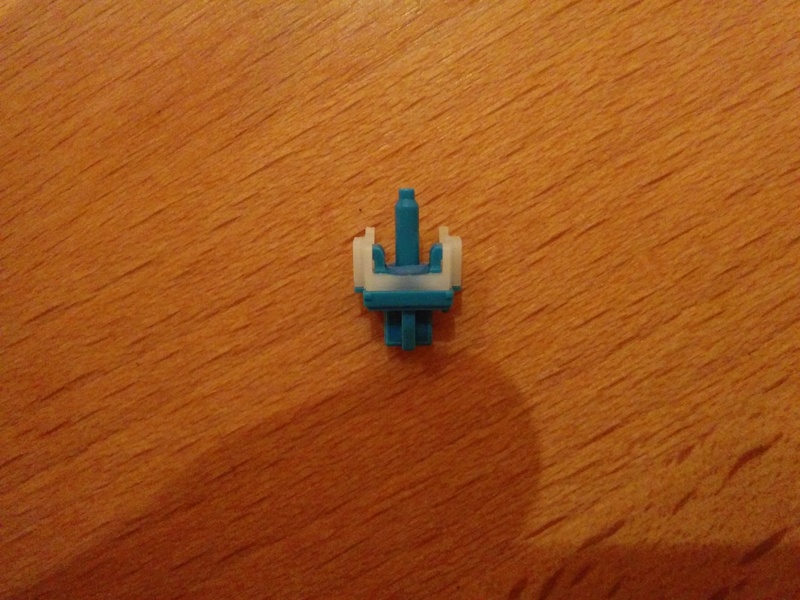 There is no click, and the stem does not move except that since the rubber squishes you can keep pressing down really hard after you bottom out and push it down farther, which is actually compressing the rubber and moving the blue stem in relation to the white piece. But it springs back up when you let go. Does that answer your question? So much knowledge will read later. I should add that it matters a great deal what the width/thickness of material you insert between the stem parts is. Not only does loose fit result in greater movement, and the click returns to some or to full extent. But if you go too thick/wide, such as by stuffing wire / plastic strips / o-rings that are too large for the opening, the white part of the stem is fairly soft, and will accommodate the extra width--and it will bend and deform. This deformation leads to inhibited stem movement within the housing, and your switch can easily get stuck. So if you do this mod, you need to be sure to not overdo it with the filler material. Anything goes as long as you don't deform the white part of the stem by bowing it outwards. 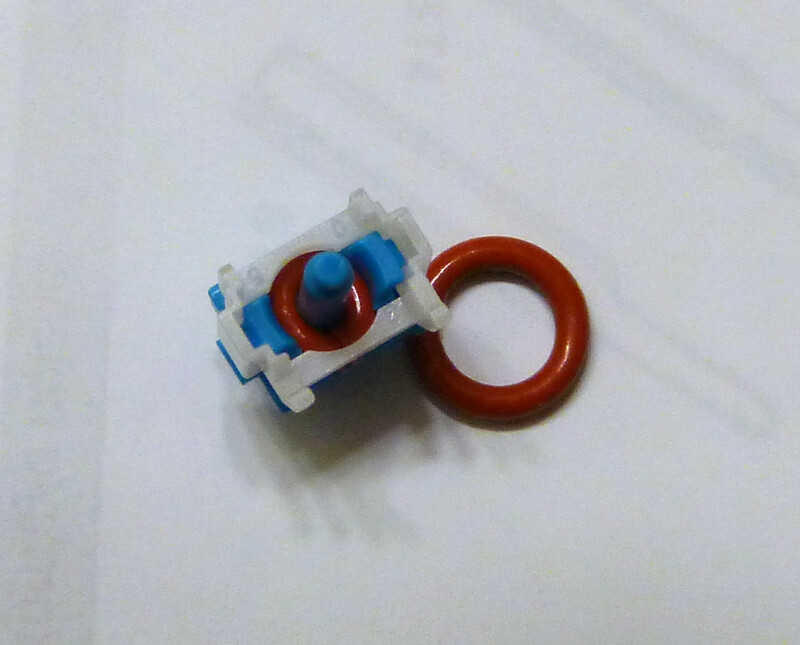 The o-rings I ended up using (IMSTO's thinnest red silicone o-rings) seem to be close to the limit of exerting little enough pressure while fitting between the white and blue part. You could go thicker, but perhaps in that case, you'd be limited to doing the tight right around the central "rod" part of the stem, thus allowing for more movement between the white and blue parts, and retaining some of the click. is it possible to make brackets by lasercutting an acrylic sheet or 3d print them to have consistent spacers which do not block the spring? has somebody looked into that? i just measured out a blue stem and was thinking how to do this as cheap and simple as possible. Interfering with the spring is not inherently a bad thing if all you do is prevent its upward movement, past the spring. You can either get a lighter spring, cut the stock spring, or go with the stiffer resulting switches. The stiffer switches on Khaangaaroo's QFR were interesting and certainly not bad. Softness is my personal preference, but I definitely got used to using his keyboard after a few days of typing on it. Just need to test whatever you end up doing by making at least like 10 switches, putting keycaps on them, and mounting them onto something. It won't give you a full idea like a fully-soldered keyboard with a plate, but it will give some idea. It's possible, I even sort of managed it on a 3d printer, and I'm still revising, hoping to get something that works. nice, i have a sheet of acrylic here and testing some stuff. Bookmarked...can't wait to try this mod. Its quieter than all the switches, even the matias quiet switch. Making it: Holy crap this is a tedious process. Cutting down the plastic to the right thickness (its way thinner than it looks) is a huge pain. Spring: Spring force feels more, but just slightly. Putting a 62g spring in it was way too much IMO. The bump is close to or greater than the bump on clears. I'll probably make a board for on the go with these. I've heard it suggested that Matias Quiet Click switches feel like they have an o ring inside the switch and have an almost bouncy feel. Are Jailhouse blues comparable to QC switches? in what ways do they feel similar / differ. I don't think so. Jailhouse blues from what I recall have a really really short throw.. Matias Quiets feel like Dampened Cream Alps to me. They've got the full actuation length of Alps with a tactile bump that is somewhere between Browns and Clears with a cushiony bottom out. Some more of my impressions of Alps can be found here if you're curious. I've read this post several times over and have found it very interesting. Sadly all it has done has convinced me I want a complicated blue alps board, which will be practically impossible to get hold of, especially for a reasonable price. Would it be possible to put the sound sample back up, please? For the mod I used the blue o-ring sold by WASD. I don't know if it is the right size or not but I decided to try. However I don't know if I succeeded in doing it, I have nothing to compare it to. I feel as if some plastic is scratching in the inside of the switch housing. It is the same sensation as for the stock linear switches like black. It feels like it needs some kind of lube. I wonder if it is some lube that went off or if I just screwed up the mod. What do you think? Does it look like a failed attempt? Hello, I made a variant of the jailhouse clicky switch, maybe that you can tell me what you think about it. - do you think that the jailhouse is good only for blues, or also for green and whites? What are the differences? For what I've seen the black part (second picture) is different in the blues/green/whites. - do you think that this mod is durable, or will it break very soon? I broke out the calipers today and did some measurements. Keep in mind, these numbers will vary depending on the method you use to make your JB's. For my method using wire, my distance to actuation was (approx.) 1.2mm, stock Cherry MX and Alps is 2mm. This makes it at the highest activation point I can find. 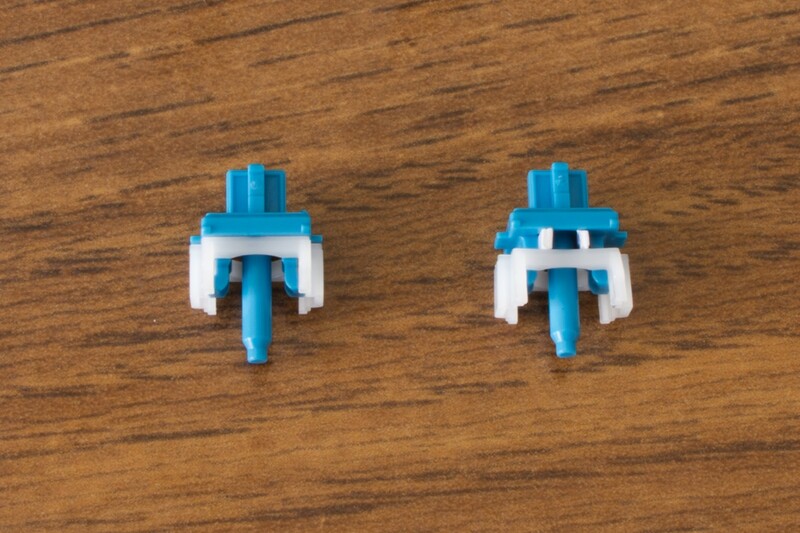 Also, if you have SP keycaps, by placing two O-rings under your keycaps, total travel can be reduced to (aprrox.) 2.3mm, which is barely any more than a normal actuation point. Keep in mind, various key cap designs need different amounts, so make sure they will still activate. Two o-rings works for letter keys, I haven't tested others yet, I didn't want to do them all and find it didn't work. It can be done to any 2 part Cherry stem, greens, blues, whatever. As for longevity, what you did will not change that, however, your spring may bind or rub with the cross only on one side, causing friction. If anyone is willing to sell a switch or two let me know I'd love to try how these feel. Has anyone tried the mod with dental bands? I have a ton extra and would love to see how it might work. Any pointers? My advice, do a LOT of testing before committing to a whole keyboard. JB's take a lot of work to accomplish, probably one of the most time consuming mods you can do on a keyboard (fickle too! ), you don't want to have to go back and redo it if you find it doesn't work, or that you don't like it. Neat new information so far! What I've learned about making JBs is that it takes a lot of attempts and playing with various combinations of whatever materials you are planning to use to get the feel right (read: to your individualized liking). And then also to get the consistency right from switch to switch. And I highly recommend using a plate that allows easy switch top removal, as you might need to readjust a switch or two in the first couple weeks of use. As an update, my o-ring mod has been holding up perfectly so far, and I've moved those stems from a Filco I originally made them for to my LZ-GH long ago, having to do a bit of straightening out in the process, as the o-rings shifted during disassembly and reassembly because of some Krytox lubricant getting onto them. But I've been using those stems for at least two years now, and no problems so far. Typing this post on them right now. I do still really like the o-ring + soft spring combination, as the end result is soft and cushiony and has a bit less resistance to actuation than stock MX Clears, which is another favorite switch of mine. When I tried JBs made by someone else who used stock (~58-60g) Cherry MX Blue springs, the end result was too tough on my fingers, but 45g compressed feels right. It's difficult to explain, and it takes a few days to type on these switches to appreciate the precise tactile feel, as an initial reaction might be like to topre: kind of rubber-dome like. But only initially. I spent a few hours last weekend jailhousing my new board. I had thought that I might want to from the start, which is why I used blue switches in the first place... but figured it was easier to do later than to undo later, if that makes sense. Anyway, after about a week, the click of the blues annoyed the hell out of me so I decided to do this. Also, while I had the switches open I lubricated the hell out of the sliders on all sides, and also inside the switch top, anywhere I thought there was any chance of plastic rubbing on plastic. I think this made a huge difference in the feeling -- none of the MX scratchiness, and it makes the switches feel so nice and smooth. I don't think I'd like this as much without the lube. My opinion after a day of using this keyboard at work: I love it! I am someone who likes a short throw and a soft landing, and these keys have both. I never really understood why 4mm of travel and a hard bottom-out is desirable -- I don't think I really like cherry MX switches at all, really. And I have boards with browns, clears, and now blues. Never tried linears but no desire to... what fun is pushing a button if it doesn't have that satisfying tactile feel to it? Anyway, this to me is salvation -- short throw, soft buttery feel like a warm cookie fresh out of the oven. I would highly recommend it if you have the same inclinations as me -- you like your slim apple scissor switch keyboard but just want something a little better, or a different layout. I will agree that the switches are a little heavy, but with the lubrication it still seems easier on my fingers than stock clears. If you find them heavy, try lighter springs! That's why I went with 45g springs, after trying out a keyboard with stock MX Blue springs (~60g). My JBs are still bumpy but quite soft--I love them. Perhaps something like 50g custom springs would be a good compromise for most. I trimmed the springs to reduce the spring pressure, you can use this to adjust the spring force. JB's are pretty stiff "out-of-the-box", being close to Greens or an IBM Model M.
Edit: Also keep in mind, this causes the springs to ramp up in pressure faster than stock, which is actually desirable anyhow considering the short throw. I did some measurements using nickels to get actuation force. Note that lube lowers another 5grams and the closer you get to 40grams, if things aren't perfect, they can stick due to the tactile bump being so pronounced. Mine all worked great at 80 (of course) but when I reached 45, my R and M needed a slight touch up to keep from sticking on occasion. I cut mine down to 3 flat coils, plus 1 normal coil, and then lubed them. If you cut them, you want the cut end down in the switch itself as it has a thick post that will keep it aligned better than up top. My technique does work with Outemu/Gaote Blues. Frankly I think it works better with them as the switches have an even higher actuation point, are smoother and more consistent, even without lube (which I don't recommend bothering with on them). Actuation is about 0.1 or 0.2mm higher than Cherry after jailhousing, and instead of a teeny dead spot, these immediately begin ramping up the switch. They feel almost identical to scissor switches right up until actuation. After actuation, they obviously have more travel, but initial feel, when unlubed was very close to an older Lenovo laptop in terms of feel. If you want scissor switches, add some o-rings under the cap and you're there. Just remember, these have a higher spring pressure than Cherry blues out of the box and I have not experimented with cutting the springs to adjust pressure. That said, I'm actually leaving these stock for the moment. One reason I jailhouse the blues was for the short throw and so the actuation and release would be in the same place. These are already do all of that quite well. then I am going to grab some springs form massdrop: 35g 45g and some 62 to just have some on hand. I am thinking Gateron Blues + the O-Ring + the really light spring = best feeling? Replied to PM. I've not considered such light springs myself, and I have a feeling 35g is going to be *very* light. I have a Cooler Master switch tester here, and just roughly comparing different Cherry variants there, my 45g spring JBs feel about as tough as stock MX Blues, though of course without a click and different travel distance. Stock MX Browns are lighter. 35g JBs might be actually lighter than stock Browns. 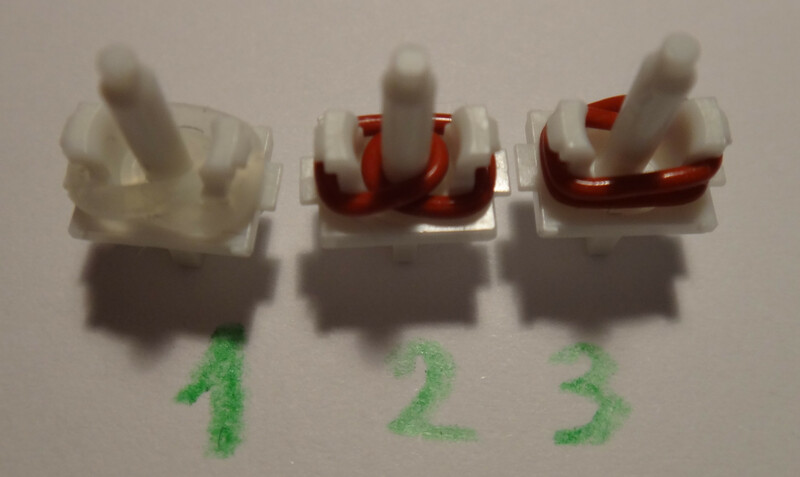 Best to actually make a few switches and test type on them (without soldering or anything) and some more with stronger springs, and see which you prefer. Regardless of methods or springs, my testing, with Cherry Blues, showed that unlubed, they needed about 40 grams reliably reset. Lubed needed 30-40 grams to reliably reset, however, after a few presses to work in the lube, that dropped to 30-35 grams. Cherry seems to have an overhead of 5 grams to ensure reliable operation, so lubed with something really slippery and thin, you can probably get away with 35grams, but you better make darn sure everything is 100% perfect, using thin caps and no o-rings, because any extra weight or friction could case them to hang. Remember, some methods of making JBs results in a near doubling of spring pressure, in which case, you can use whatever spring you want without issue. 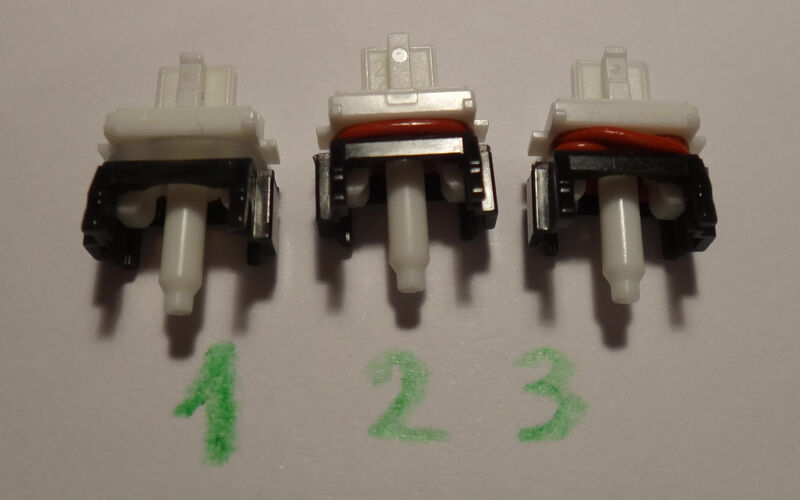 Gaterons may be smoother (I don't have any to test), but that may not equal the needs for less spring, a switch can be more smooth and still require more force to operate due to ram profiles and plastics involved. Not to mention great care must be taken to make sure they are consistent from one to another. Pretty interesting mod, I wonder what technique would give the most consistent results. It actually sounds great and I might experiment with it once I get some new orings. I don't think anyone has tried more than one or two methods, most of it comes down to attention to detail. Just make sure they work right and consistent before you put it all back together. Thinking of going by my dentist and asking if he's got some small enough rubber bands so I don't have to do any cutting. This should help in consistency. Hi all. 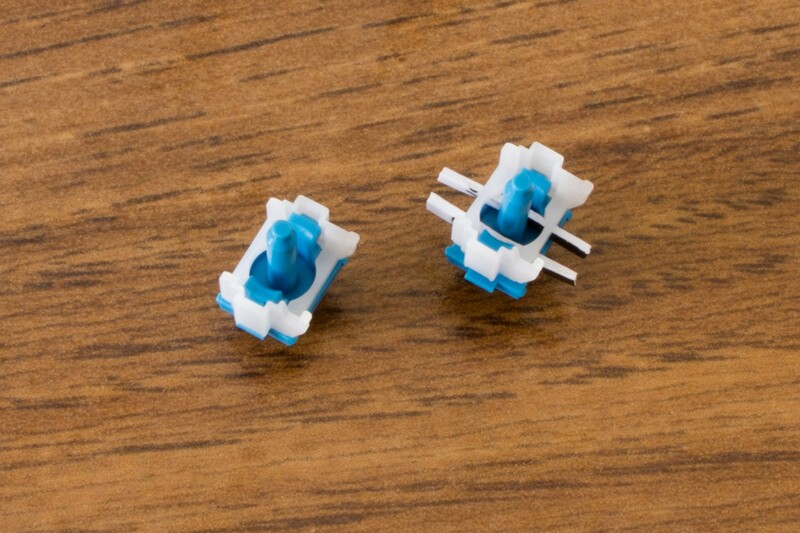 I joined solely to ask a question about this mod: If I buy a WASD V2 (which I'm really keen on from every other aspect other than the switches), will I be able to perform this mod on it? 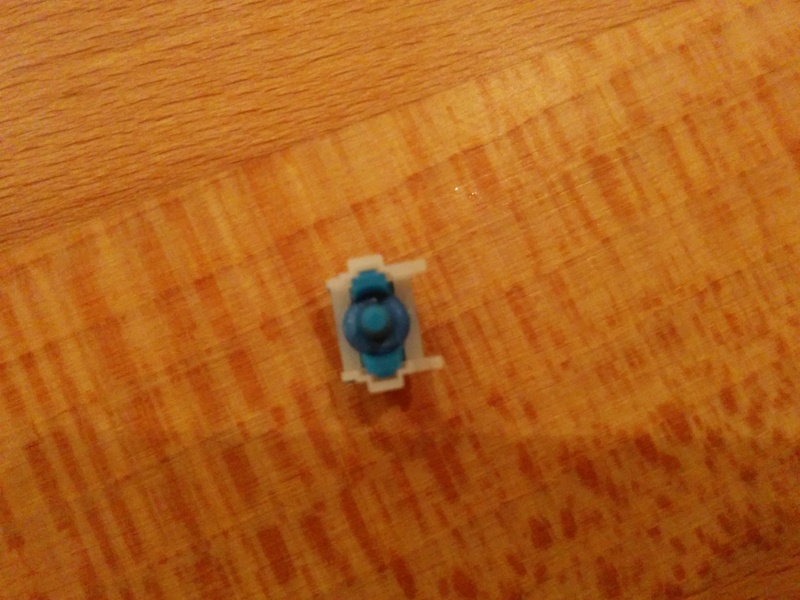 I did the mod on an MX switch tester just using some 1mm solder I had lying around (used gloves, I realise it's toxic) just to see how it would feel and LOVE it, even without messing with the spring. 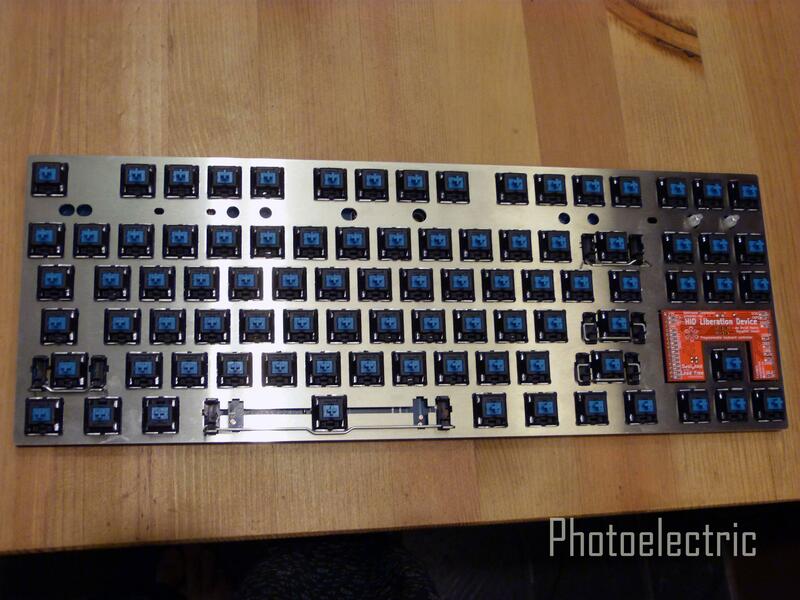 1) can the switches be removed from a WASD V2 without soldering? 2) is it possible to do this mod without removing the switches from the WASD V2? If so, how hard would it be? I've replaced screens on mobile phones and stuff, but if you guys who are experienced reckon it's really hard I'd take that as a warning sign. I've tried out the other MX switches and didn't particularly like them. The clear came close but was a tad too hard to press, didn't like the wasted travel before actuation, nor pinging noise. Thanks for any info in advance! Hardly any pre-made boards come with plates where you can remove the switch tops so you will need to desolder the switches to open them up. Desoldering isn't hard you just need a good iron and a solder sucker, if you're considering jailhousing I guess you have plenty of time on your hands which is good as it can take a while depending how friendly the board is - randomly some switches just don't want to come out! You're probably going to have to de-solder. My advice, desolder a couple keys, you never use (print screen, scroll lock, etc..), jailhouse, make sure it works without binding, then put them back in and see how you like the travel. Then take them back out and trim springs to tune the spring rate, don't go too soft or they can stick, much below stock blue rates and blues have trouble. The need to do this depends on your method of shackling, my method leaves you with springs in the 80 gram range unless you cut them. Once again, check for binding before putting them back in. When I say check for binding, don't just press it once or twice, you need to press it a bunch, especially if you lubed it. Remember, if it wedges and binds later, you have to desolder to fix it, so make sure it works before you put it back in. The reason for doing the unused keys first is if you damage the pcb or switch, you won't care. If you don't like it, you can ignore them until you feel like undoing it. I say this because not only are JB's quite different, but they are also fickle and very time consuming. 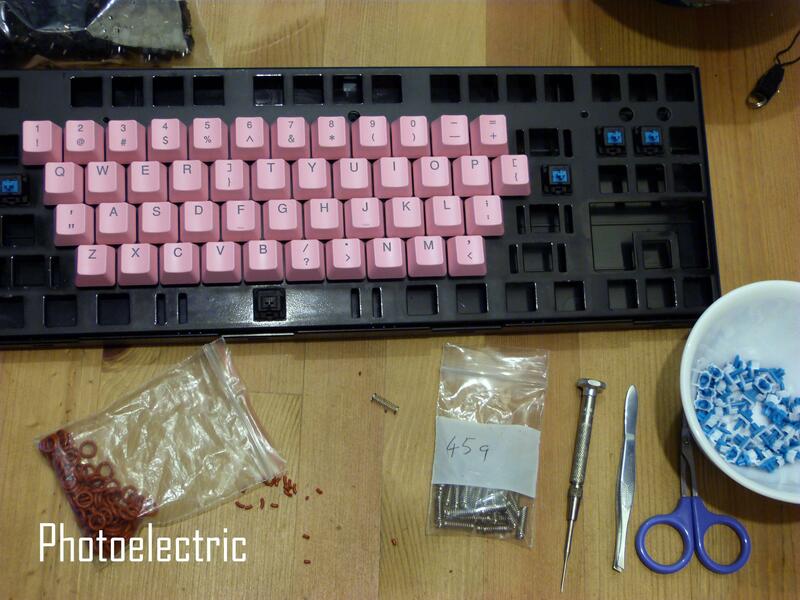 This is one of the most in depth, risky, and time consuming mods you can do to a keyboard. 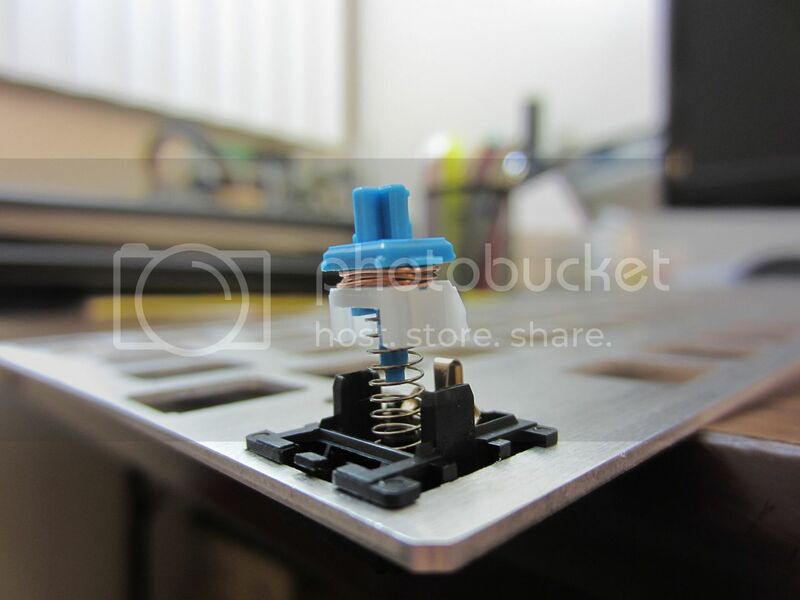 If you mess up, you may be buying new springs, switches or maybe even a new pcb or keyboard. So it's not to be taken lightly.